Last you heard, the Stepford Wives were potential conspirators in a murder scheme so sophisticated that, considering their teeny goldfish brain-size (one sixteenth of their actual body size) and their capacity for maintaining information with a memory bank that could hold an estimated half of a thought, (or one verb and one noun respectively) for approximately three months, given they survived that long, it would seem highly unlikely that our heroines of the tank could pull off something like this. Twice. My ten gallon residential tank, aptly named the Tolerance Tank, had never experienced anything quite like this in it’s five short months of existence. 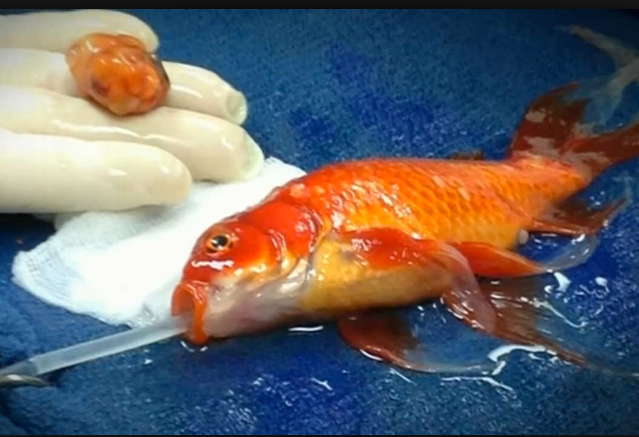 It wasn’t just one beautiful life of a fish snuffed out prematurely, but two. Two innocents taken in a tank full of potentially intolerant, self-involved goldfish. Stepford Wives mingle with Pimp Daddy, Creamsickle and Maria prior to…”the event”. It’s just not right. 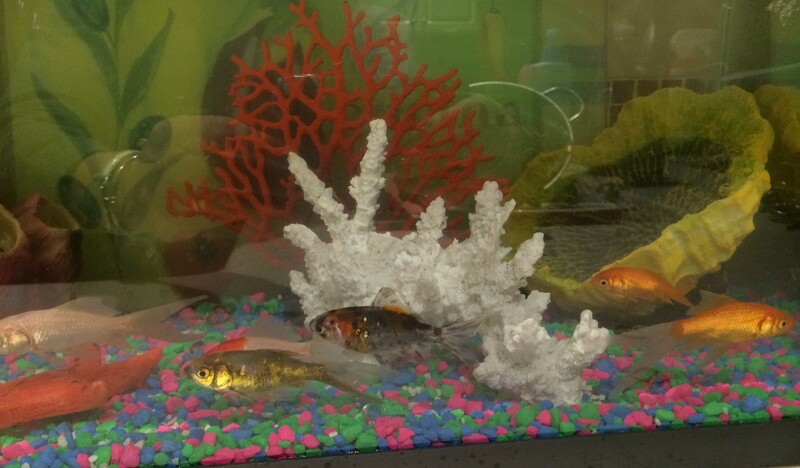 We might ask ourselves what our two victims, Maria the speckled, tricolored samba-swimmer and a very flashy, gold colored fish with a penchant for rapping to Frank Sinatra tunes , Pimp Daddy Gangsta, have in common. And why would they threaten a small tank of orange colored goldfish who liked to call themselves the Stepford Wives? These “Wives” consist of Bobbi, Claire, Sarah, Joanna and Charmaine. None of these femmes fatale have been married or even engaged as far as I know. In the tank among our “wives” remain Thor, an effeminate white bodybuilder fish; and a two-tone fish named for an ice cream treat I had happened to be craving at the time, Creamsickle. I enjoy a good rootbeer float as well, however, it sounded a bit damning as a name for a fish. Each of these fine coldwater loving creatures was relocated from the local Petsmart with dreams of a new life in the suburbs. 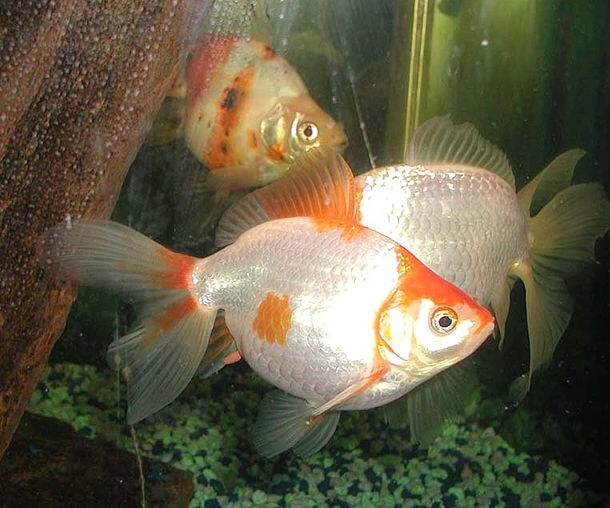 Feelings of joy shown on their upturned mouths with the thought of fresh flakes of fish food being sprinkled in abundance from somewhere in the sky into the tank daily. There would be no more of that nasty threat to survival due to the tank of thousands of colorful fish dive bombing eachother in order to get to the meager pet store morsels, usually ending up with only the bubbles from that small, quick, speckled fish that consistently took more than his fair share of the finite amounts of sustenance. Creamsickle…not because she chose that name, but because I was hungry; and Thor directly to the right of her. He’s a teeny shy. 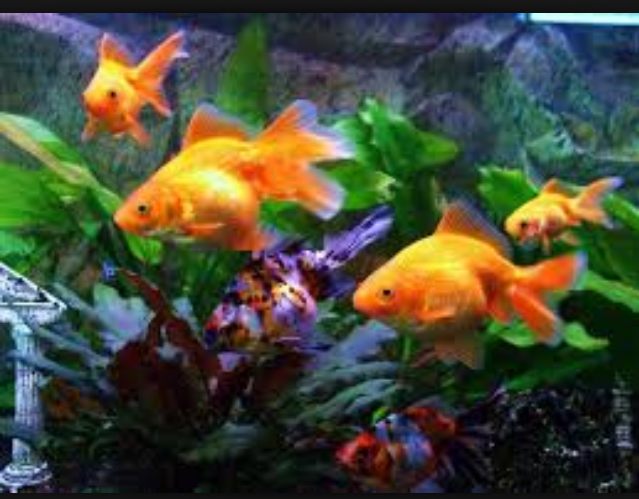 •Fun Fact: Recent polls suggest that male goldfish think about food every fifteen seconds. It is no surprise that both Maria and Pimp Daddy were two of the newest of newbies in our Tolerance Tank neighborhood. Each joined the tank with a specialty of sorts, she a samba dancer and he a rapper. Both were minority fish: Maria with her brilliant speckles of color and Pimp Daddy with his flair for fashion and expensive looking exterior. I already mentioned how he’d been mistaken for gold coins by fishermen in his life prior to the unfortunate Petsmart relocation in my last update on our friends. Both came from rough neighborhoods originally, she from Phinny, he from Brookfin. Both neighborhoods were notorious for celebrating various traditions and holidays in flamboyant, joyous ways using lively music and lots of bubbly; gestures that may have ruffled a fin or two of our superstitious and uber controlled “Wives”, preferring to catalog shop, then snail-mail the packages rather than celebrating among anyone other than their safe little clique. Did any of these water breathers have a history together? And where is CSI when you need them? And we’re up a creek since fish won’t talk…. Besides the disappearance of Creamsickle, the Tolerance Tank has been running pretty smoothly lately. Thor keeps to himself while the “Wives” entertain each other with Bunko every evening after their feeding. Tell me folks, what is wrong with this picture? I shall take my leave to think. 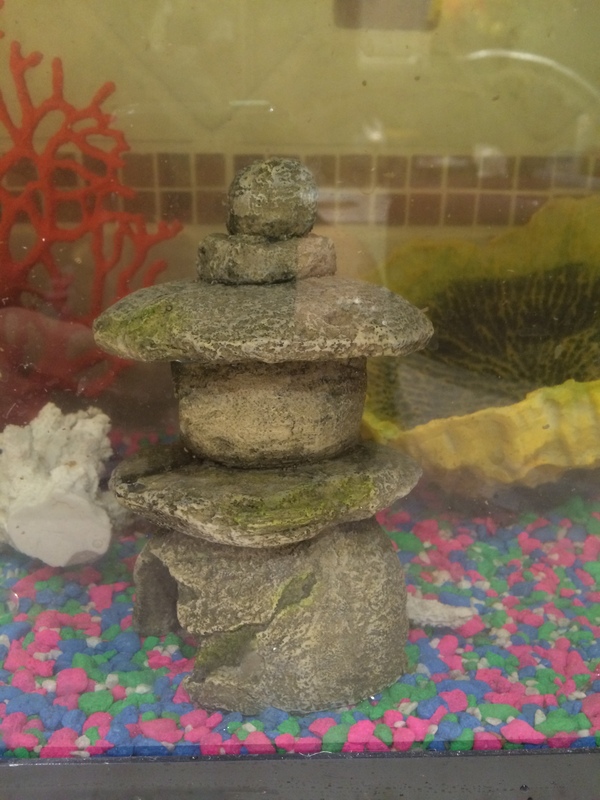 S/He was found lying underneath the gazebo in the far left corner of the Tolerance Tank! How on earth did the gazebo end up ON TOP of my Creamsickle??? Not floating does not mean NOT DEAD apparently. With no pulse all I can surmise is that Creamsickle is victim number three in the Tolerance Tank Serial Killings. There s/he is…see the white tail looking thing peeking out from the gazebo structural looking contraption? What is wrong with this Tolerance Tank??? “Friends” not looking above or beside him/her! I. AM. APALLED. This leaves me to wonder still…. Because Creamsickle was named for my craving, does that mean I will no longer feel the need for ice cream of the vanilla- orange sherbet kind? Could I ever partake again?! What are we to take away from another ghastly day in the Tolerance Tank? If you happen to see the ladies pictured here: Bobbie, Joanne, Claire, and Sarah…be frightened…we may be dealing with masterminds here. Although they appear harmless enough, their tiny brains are most likely hatching a plot to take over the Tank. Oh dear, where’s Charmaine? Anyone seen Charmaine? Oh dear God…. A. Something fishy is going on in Tolerance Tank Town. B. Maria, Pimp Daddy G and Creamsickle were either strategically murdered by a shameless gang of Wives, or our white confection-looking, Thor. Unless, of course, they were simply victims of unpleasant circumstances. C. Thor is the only minority fish left now shacking up with our Wives; all living separate lives it appears. Either they each have an iron clad alibi or someone’s up a creek without their fins! Tune in next time as we take a peek inside the Tolerance Tank. You will be missed; the extra pounds will not! Previous PostTwinkle, Twinkle Little Star….aw, bite me.